Each annual Peka Totara magazine contained a list of the staff and pupils of Penrose High School for that year and is a valuable source of names of those pupils and students and in the case of the girls, their maiden names. In the 1950's there was much immigration to New Zealand from the UK and Continental Europe, much of it assisted. Penrose High School was founded in order to provide for the secondary level eductional needs of children born after World War II and also those of immigrant families. The suburb of Penrose was at that time, the industrial hub of Auckland and therefore an area to which many young families moved and was thus an area of high population growth. 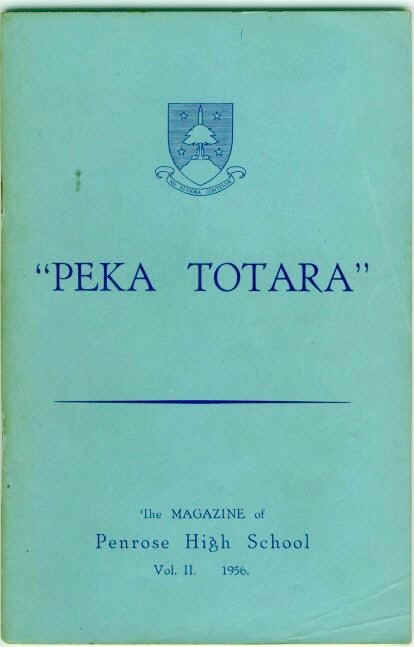 Following its founding in 1955, each year Penrose High School issued a school magazine called "Peka Totara".